While most Americans are aware of the dangers inherent in distracted driving, few realize the dangers of distracted walking (also known as texting while walking or TWW). For some, the phrase ‘distracted walking’ conjures up images of comedic pratfalls. But, as emergency rooms physicians can attest, distracted walking is no laughing matter. Although there is no reliable way to track the extent of TWW injuries, estimates suggest that approximately 1,500 people were treated in emergency rooms for distracted walking injuries in 2012. But emergency room physicians say that number is a gross underestimate because injured patients are reluctant to report the real cause of their TWW accidents out of embarrassment. Dr. Dietrich Jehle, professor of emergency medicine at the University of Buffalo, believes that mile for mile, distracted walking causes more accidents than distracted driving. Although distracted driving injury accidents are more severe, Jehele notes that distracted walking accidents happen more frequently. Distracted walking accidents often cause minor injuries to pedestrians, such as nosebleeds, scrapes, twisted ankles and bruises. But they can also cause serious and lasting injuries requiring complex and costly medical care, such as facial fractures, foot and ankle injuries, broken bones, head injuries and, in the worst case scenarios, even death. News reports of distracted pedestrian accidents may catch us by surprise, but experts caution stories like will become more widespread as the use of Smartphones and other electronic devices skyrockets among pedestrians. For example, in Philadelphia, security cameras captured terrifying footage of a young man walking alone at night at a train station while looking down at his phone. He suddenly tripped and fell head first onto the tracks. Luckily, there wasn’t a train coming at the time, and he was able to scramble onto the platform before he received a serious head injury or was killed. In another case, a man in a suburban Los Angeles neighborhood was walking, so engrossed by the message he was sending his boss that he almost walked directly into the path of a black bear. Fortunately, he looked up in time to see the bear, then took off running. A news helicopter, in the area to track the bear, caught the entire incident on tape. Authorities have reported countless cases of distracted walking accidents, some with tragic consequences, including the case of a 12-year old boy who was hit by a truck as he crossed the street while playing a video game. Others include injuries which could have been easily avoided had the parties involved exercised common sense, as in the case of a 67-year old man who was walking alongside the road; he was hit by a bicyclist who was distracted by his cellphone. In yet another case, a woman fell off a pier and into Lake Michigan because she was looking down at her phone, checking her Facebook status. Good Samaritans came to her aid almost immediately, helping her from the water, and she was not seriously injured. Although many pedestrians believe they can walk and use their electronic devices or Smartphones safely (“What’s the problem, can’t walk and chew gum at the same time?”), they are mistaken. Dr. Jehele points out that pedestrians are no more capable of handling distraction while walking than they are while driving. When people walking, especially with their heads bent in concentration, staring at their cell phone screens, they are dealing with three distinct types of distraction; manual (e.g. typing a text), visual (e.g. looking at a photo) and cognitive (e.g. thinking about how to respond to a text). The human brain is not wired to handle multiple distractions with ease. Although we live in a society which prizes electronic devices as time savers and sees multitasking as a foregone conclusion of modern life, our brains cannot process information from multiple sources as efficiently as we would like to believe. Scientists who study attention and our ability to concentrate have labeled this phenomenon “cognitive capture” or “inattention blindness”. When we are using Smartphones or other electronic devices while walking or driving, scientists have found that people become so focused on the “world inside the phone” that their minds become blind to the real world outside the phone. That’s why it becomes remarkably easy to walk into telephone poles or off train platforms when we’re busy sending texts or checking Facebook statuses on Smartphones. Inattention blindness literally blinds our minds from seeing what is right there in front of us, leaving us in real danger of being seriously injured. This is why distracted walking is not a punch line or something to laugh at- it’s a real danger, and also why distracted driving is a true public health menace. 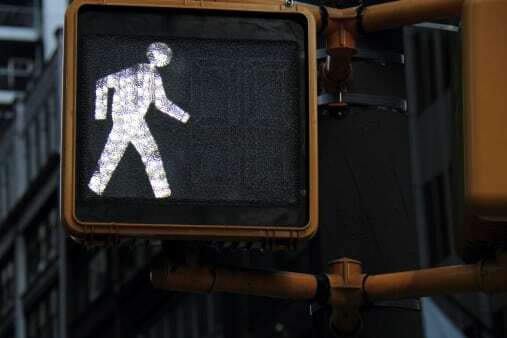 Distracted Driving and Distracted Walking: Just Don’t Do It! Electronic devices, Smartphones and cell phones are wonderful devices when used safely. But as a society, we can not ignore the very real dangers they pose. Whether we’re walking or driving, the use of cell phones and electronic devices pose a serious danger, to ourselves and those around us. Attention blindness is a measurable and real phenomenon that literally causes us to behave as if we’re in another world, blind to what’s happening in front of our very eyes. The next time you are tempted to pull out your cell phone while you’re out for a stroll or when you’re driving in your car, remember the phenomenon of inattention blindness and make a conscious choice to make safety, your own and the safety of those around you, your top priority. The personal injury attorneys at Hardy, Wolf and Downing want you and your family to be safe. Remember to watch your step next time you’re out for a stroll, and keep safety at the top of your list. Don’t engage in distracted walking or distracted driving. If you or a loved one has been injured in an accident and would like to begin understanding your rights, please call the experienced personal injury attorneys at Hardy, Wolf and Downing to schedule a free and confidential evaluation of your case. Attorneys in our Lewiston andPortland law offices are available to answer your questions regarding your injury accident and will put our expertise and experience in the field of personal injury law to work for your family. Our personal injury attorneys provide our blog as a service to our clients. They are meant to be purely informational. If you or a loved one has been in an accident and would like a free consultation with a personal injury attorney, please call our firm today at 1-800-INJURED to start understanding your legal rights.